I suggest using post it notes to label all your bits and pieces from here on in so that you don’t get confused. 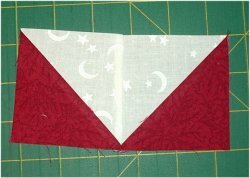 Now you need to sew two of the triangles of background fabric together to make this psuedo HST thing. You’ll need two of them and we’ll call them Unit #1. While we’re working with those triangles let’s use the other ones up too. 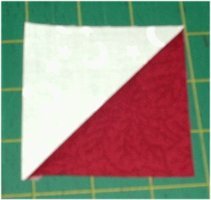 You’ll need to sew two triangles to a 3″ square of background fabric like below. You’ll need to make four of these units and we’ll call them Unit #2. 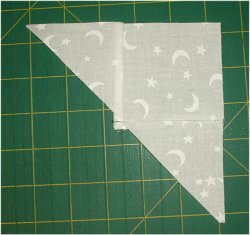 Now you’ll need to sew two HSTs together as shown below. We’ll call this Unit #3 and you will need twelve of them all together.